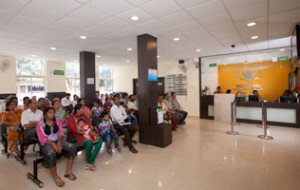 The Front Office of NU Hospitals is typically a busy, fast-paced hive of activity. The department is manned by an experienced manager who goes through a steady stream of telephone calls keeping her receptionists constantly busy in offering appointments and information to patient’s who arrive very early in the morning to keep up with the scheduled doctor’s appointment. As the receptionist greets you at the counter, she likely also keeps a message pad beside the phone with dozens of messages for nurses or doctors. She also takes multiple incoming telephone calls from patients who want to schedule appointments or find out some information or the other. The front office also provides information on laboratories reporting results, hospitals reporting on inpatients or scheduling surgeries and other medical services available in the hospital. The front office is also responsible for preparing individual patient file and entering records in Hospital Information System. The front office also serves as Secretarial/Administrative help to consultants and doctors of the hospital keeping track of patient movement and scheduling and fulfillment of appointments Another frequently busy section of front office is the insurance specialists. In fact, they are often seen working closely with hospital medical departments and insurance companies combing through patient files to encode diagnostic and procedural information into standard protocols. With a thorough understanding of both medical terminology and billing practices, our corporate relations executives work hard to make sure they make patient insurance process & insurance claim fruitful. The Billing/front office executive will provide necessary services in processing patient treatment bills and final settlements. They also facilitate communications between various interconnected departments of the hospital.